16" (L) x 20" (H) x 2" (W). Mixed media on canvas with acrylic paint. 3D materials: Hair extensions for hair and eyebrows. False lashes for eyelashes. Gold metal for hair barette. Red fabric with gold trim and buttons for shirt. Hand embroidered golden crab. Glitter and gems for background. Mixed Media on canvas. 3D Materials: hair extensions, false lashes, earrings, button, fabrics, buttons, and acrylic nails. Email if interested in purchasing. Mixed Media on Canvas with acrylic paint. 3D materials: Hair extensions, false lashes, black fabric, tropical pattern fabric, black sequin fabric, gems, glitter, play money, and metal spikes. 14" (L) x 11"(H) x 1.5"(W). Mixed Media with Acrylic Paint on canvas. 3D elements: Fake money, banana stickers, foam paper, reflective sticker, felt material, hair extensions, button, fabric and gold elastic. 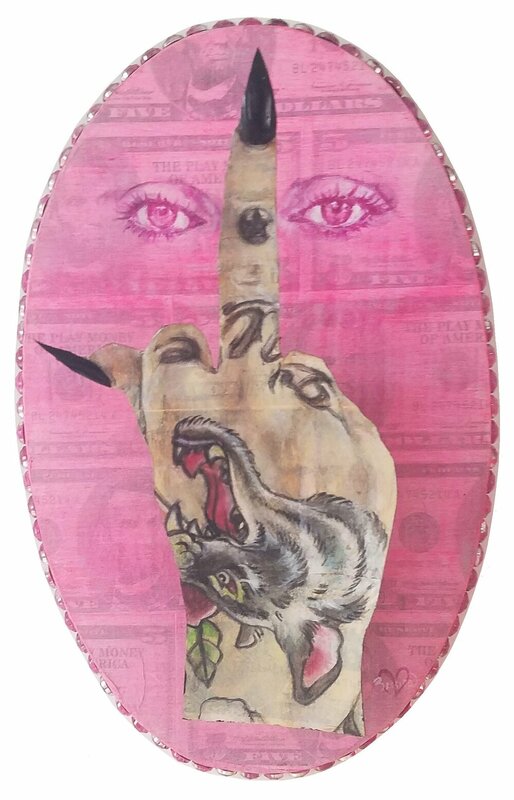 Painted and paper mached play money on oval wooden panel. Hand is attached by a spring that moves when touched. Acrylic fingernails are attached to hand. "Can I Interest You In Some Danzig?" 3D Materials: Acrylic paint, foam paper, Metallic Mirage sticker decal, necklace chain, star, skull bead, cocktail umbrella picks, rings, gems, jewels, glitter, chain, hair extensions, metal studs, silk fabric and cotton fabric. Mixed Media with Acrylic Paint on Canvas. 3D elements: fake money, hair extensions, sunglasses, cardboard, fabric, thread, jackets, shirts, gold chain, molded hand, and acrylic nails. 18" (L) x 18" (H) x 3" (W). Mixed Media with Acrylic Paint on Vinyl Munny Doll. 3D materials: Cotton fabric, jean fabric, hair extensions, false lashes, metal studs, erasers, acrylic nails. 14" (L) x 24"(H) x 2.5" (W). Mixed Media with Acrylic Paint on Canvas. 3D elements: Fake money, hair extensions, reactive foil, false lashes, fabric, fabric paint, glitter, glow in the dark material, and pearls. Mixed Media with Acrylic Paint on Canvas. 3D Materials: Fake money, hair extensions, individual false lashes, cotton fabric, pleather fabric, heart tacks, and cord with phone. 30"(L) x 30"(H) x 3"(W). Mixed Media with Acrylic Paint on Canvas. 3D elements: Fake money, hair extensions, cardboard, chain, and tin foil. Mixed Media with Acrylic Paint on Canvas. 3D elements: Fake money, glitter, hair extensions, cat toy head, artificial monarch butterfly wings, gems, small piece of wood, compact mirror, jewelry, silk fabric, thread, chain, and skeleton dog mold. Mixed Media with Acrylic Paint on Canvas. 3D elements: Fake money, jewels, gems, cardboard, silk fabric, felt material, hair extensions, false lashes, wire, clasps, studded ribbon, acrylic nails, and beads. Mixed Media with Acrylic Paint on Canvas. 3D elements: Hair extensions, pills, large artificial flowers, false lashes, bead and fabric. Mixed Media with Acrylic Paint on Canvas. 3D elements: Hair extensions, paper, false lashes, fabric, apron, guitar tuners, guitar string, guitar tuners, guitar strap, guitar cord, guitar knob, guitar pic, and acrylic nails. Mixed Media with Acrylic Paint on Canvas. 3D elements: Romance Novel paper, false lashes, hair extensions, wire, chains, jewels, belt, long underwear, leather ribbon with spikes, and acrylic nails. Mixed Media with Acrylic Paint on Canvas. 3D materials: Afro hair extensions, cotton & pleather fabric, and Newspaper. Mixed Media with Acrylic Paint on Canvas. 3D elements: Fake money, hair extensions, acrylic nails, epoxy, rolling paper, vinyl paper, foam paper, jean fabric, boxers, and cotton fabric. Mixed Media with Acrylic Paint shaped into a large joint. 3D material: Afro hair extensions, acrylic nails, gold metal, and silk fabric. Mixed Media with Acrylic Paint on Canvas. 3D materials: Hair extensions, felt material, and gems. Mixed Media with Acrylic Paint on Canvas. 3D materials: Nails and felt material. (L) 6in x (H) 6in x (W) 2in. (L) 6in x (H)6in x (W) 2in. Mixed Media with Acrylic Paint on Canvas. 3D materials: Red cotton, ribbon, felt material, and gems. You can play the game at restaurant TacoLu, 1712 Beach Blvd in Jacksonville,FL.